Outdoor Fire Pits: The Perfect Way To Keep Yourself Warm This Winter! The best way to spend your chilly winter evenings is to sit by a fireplace taking in the warmth of the fire, with your favourite drink by your side and your close ones for company. But creating a fireplace inside your house and maintaining them is too much work. Moreover, there is danger of fires with the fireplace located indoors. The best option is to have an outdoor fire pit which will eliminate the need to install special safety measures for your house and clean it up everyday. Outdoor fire pits are the mot popular home backyard projects now. You could design your own outdoor fire pits or get a preset gas pit ordered. 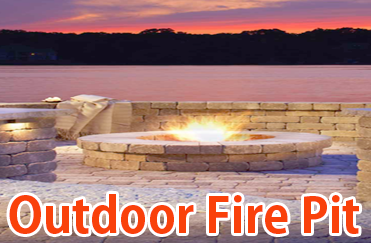 Outdoor fire pits are the invention that has eliminated the need of investing extra time, effort, and money into fireplaces and even when you want to have your own bonfire nights and barbeque parties these outdoor gas fire pits come in handy. Nowadays you can choose from a wide variety of sizes and designs and different patterns and colour combinations. You could have a design preset kit and assemble it on your own or get it made by a mason. From wall block designs to concrete, various configurations are now available in the market. But selecting the right height, width and depth is important. With the help of custom gas pit kits available today, making an Outdoor Fire Pit is as easy as building a lego house. You just need to choose your colour and design and get working. Fire pits run from gas as well as flame glass beads. With gas pits, you will be provided with a burner, and a pipeline and cover it up with glass. Also, you could use the conventional wood block assembly to have a more authentic effect. For that you need to leave the inside of the block empty and insert wood in there and just burn it. But the downside with wood burning pits is the unnecessary smoke and ash which will just be unsightly and difficult to clean up. With gas pits, the fire assembly is less messy, easy to maintain, smoke free, and also aesthetically appealing. Companies provide for services where they install your outdoor fire pits for you but make sure to determine the quality of the fire pits and also be sure to shop smart by comparing prices and looking for verified and reliable dealers before making your purchase. Also, you need to make sure that the pit you choose is ideal in terms of the size as well as setting of the outdoor space you’re choosing it for. Nowadays companies also provide a whole kit with which includes accessories, lava rock, fire proof glass, burners, gas connectors, valves, etc. Outdoor fire pits are an excellent and economical option for maintaining your backyards and party spaces. They also help you relax on a cold winter evening without having to spend hours trying to start a fire. Having a good outdoor fire pit is the perfect way to relax on a cold, boring weekend and have the perfect parties with zero mess the morning after.